Last week, we gave you 5 great spring cleaning tips. This week, we’ve got 6 more for you. Spring cleaning is definitely not an all at once kind of job. You have to break it up into chunks unless, of course, you hire us to do the spring cleaning for you. Clean ceiling fixtures. You should dust and clean your ceiling lights and fans. If you have the fans running for winter usage, turn them back to the summertime setting (counterclockwise) so that the cool air can settle in the room. Be careful to turn off the fixtures before cleaning them so you don’t get overheated or blow dust all over the room. You can also take this time to remove dust from air conditioners. A cloth and a vacuum with a soft nozzle attachment will get the job done. Update your bed linens. Spring is a great time to replace your bed linens. You can bring out the pretty, flowery comforter and sheets for a spring time rejuvenation of your sleeping space. Make sure to wash your used bed linens and put them away safely and securely for next winter. You may want to wash the new bed linens first for that crisp, clean feel. Protect your wooden floors. You can easily guard against scratches on wooden floors. Make sure that there are surface protectors on the underside of furniture legs. Replace any protectors that are worn or dirty with new ones. You can get them at home improvement stores. You’ll want to use the thick, padded self-adhesive disks. Remember, a build-up of grit can scratch your wooden floor. Clean your refrigerator. You may find this task a little daunting so we suggest you break it down into pieces. First things first – wipe up spills so surfaces don’t become stained. Throw out old food once a week, preferably on trash day. Every few months, you should wash the fridge’s interior. Wash removable shelves and drawers. You can loosen hardened spills by wetting the area with a cleaning solution and allow the residue to soften. A toothbrush can be used to scrub nooks and crannies. Twice a year, vacuum or brush dust from the condenser coils. This will keep your system from overheating. Reorganize your book shelves. You should consider sorting your books by size and subject. It’s easier and neater than just alphabetically by author or title. You’ll want to remove and discard any ripped dust jackets. For a quirky twist, line some of the books vertically and some horizontally. This will break up the monotony of the rows. Restock home cleaning supplies. Make sure you have all the cleaning supplies you need. You’ll want to have a glass cleaner and an all-purpose cleaner. You’ll also want specific products for problem spots like tile and grout. You may want natural cleansers like vinegar and baking soda. You’ll also want to stock up on sponges, rags, scrub brushes and rubber gloves. With these six tips, we finish our basic spring cleaning tips for you. If you need help with any of this, feel free to call Maids Around Town. 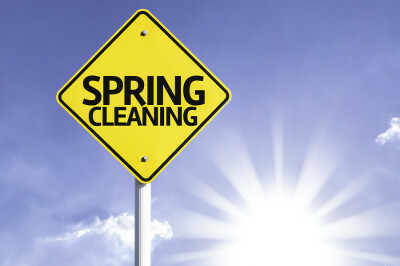 We’re experts at spring cleaning and we can be reached in Austin at 512-782-4578 and in Houston at 832-930-3210.